As the wearer of the best moustache and ponytail combo in all of golf, Stan Eby is the stuff of legend. He has designed some of the greatest European courses of modern times – three have been named Best New Course of the Year by Golf World magazine: PGA Golf de Catalunya, The Faldo Course at Sporting Club Berlin and The Montgomerie at Carton House Golf Club. 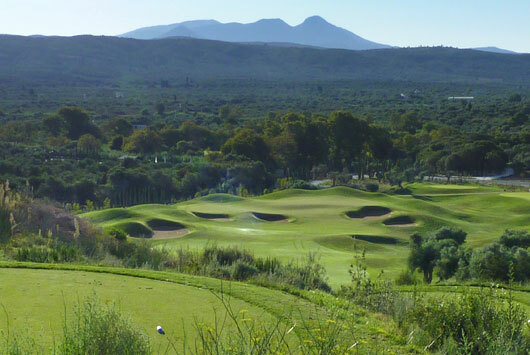 As well as those, he’s worked on some other fine courses – The Links Portmarnock, Euphoria Golf Estate in South Africa, The Schloss Course at Fleesensee outside Berlin to name but a few. He and I spent time walking a beautiful coastal site in Turkey. It had everything – full access to the beach, dunes, rolling terrain, vegetation, ample space, ample water and outline planning already in place. In short, it was easily the best site I’d seen in years. After two days on site, Stan’s assessment was simple and plain: “Not bad”. And that was it. Nothing more. On the other hand, that was also the most positive reaction I saw from him of any site we ever looked at together. Stan retired a couple of months ago but has remained in the UK while he tidied up his affairs. He leaves to go home to the US on Thursday. We will all miss him. We’re all grateful for the contribution he has made to the company, and to each of us. Each of us is the better for having had the pleasure of working with him and I know everyone here wishes him much happiness for the future. We also hope this is not goodbye. 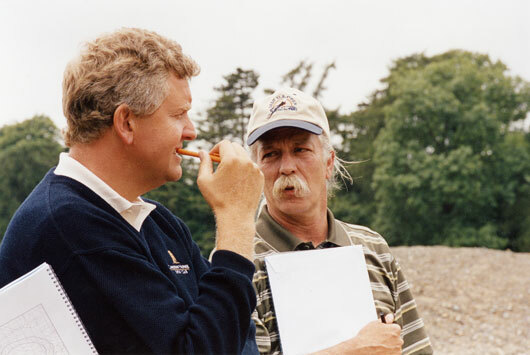 Above: Colin Montgomerie on site with Stan Eby at Carton House, Ireland. To the next 20 years! 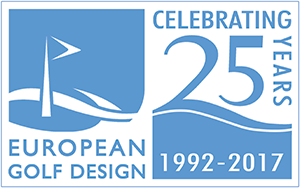 We reach a significant milestone in the history of the company this week – on 19th February 1992, European Golf Design was incorporated as a joint venture between the European Tour and IMG. The joint venture remains in place, as does Ross, who was here on the very first day and still shows up every morning with all the enthusiasm of a puppy (or have I got him confused with Mac?). As a company, and as a group of colleagues, we’re proud of what’s been achieved and hope there’s an awful lot more to do – we’ve been very fortunate to have had the chance to work on some great projects, with great clients. We’re grateful for the support we get from the Tour and IMG and hope, in turn, that we’ve added value for them too. I want to thank everyone here: Queenie, Ross, Shara, Matt, Alex, Dave, Rob and Gary – it’s incredibly rewarding working with such a talented and dedicated group – as well as thanking all of those who have been with us for a time and then moved on: Andy H, Andy B, Maggie, John, Paul, Will, Tim, Russell, Edward, Peter, Colin, Sarah and Stan – thank you all for your past efforts. And as for the next twenty years? Who knows, but let’s hope there’s more great projects and good laughs along the way. It’s been an interesting few weeks as we’ve come out of the Christmas and New Year haze. There’s some exciting things coming up which are not quite finalised yet, so we can’t quite share them with you now, but keep watching in coming weeks. In the meantime, I’ve spent my time, seemingly, on Eurostar between London, Brussels and Paris. I sit on the European Golf Association Golf Course Committee on behalf of the European Tour. The Committee is made up of representatives from eight organisations: European Golf Association, R&A, European Tour, Club Managers Association of Europe, European Golf Course Owners Association, Federation of European Golf Greenkeepers Associations, European Institute of Golf Course Architects and the PGA’s of Europe. It was established such that there was a unified body through which European golf could engage with the European Parliament and the European Commission. We meet normally twice per year – once in January in Brussels (our meeting was two weeks ago) during which various meetings are arranged with MEP’s and officials of the Parliament, and then during the European Parliament’s Green Week event, which is normally held in June of each year. The other Eurostar trip was earlier this week to Paris for meetings relating to the 2018 Ryder Cup at Le Golf National. Planning has started in earnest for that now…after all, there’s only six years to go! By the way, if you’ve not traveled by Eurostar before, give it a go – two hours and five minutes between the centre of Brussels and the centre of London, or about two and a half hours between Paris and London. It’s quick, convenient, relaxing and very altogether very impressive. We’ve won, over the past few months, some really interesting work for the next year or two. We’re going to be working with old clients again and new ones, in countries we’ve worked in before and in places we’ve never been. We’re in the middle of pitching for other projects that are, in various ways, utterly fascinating. We’d love to do them all, but would be happy if just one of them came our way. The world is changing. We have to change too. We’re looking at everything to see how we can be better, how we can be more adaptive to the changing world. We’re trying to be more proactive in our approach – this has led to some potentially great strategic relationships with key partners, and in key regions of the world. There are new opportunities out there – we need to do all we can do to ensure that we are open to those. We’re looking forward to that challenge a lot. Just as the world is changing and, as a company, we need to change too, so each of us is developing individually. One of the real joys of my job is seeing how everyone here strives to improve each time there is the chance to do so – I’ve never heard anyone say, of anything, that we’ve ‘cracked it’ and that we don’t need to try to make the next project/report/proposal better than the last. And, time and time again, they somehow manage to achieve just that. Our work continues to gain recognition. We don’t set out to design courses to make ‘Top’ lists – our goal is to listen to clients, to understand what they want and then to deliver it. Flawlessly. But, it always helps when others do recognise what we’re doing – this year’s Top 100 Courses in Europe featured five of our projects, which we’re hugely proud of. It ranks us, along with Cabell Robinson, as the most recognised design group in Europe. The market is tough, and it doesn’t look like it will be any less tough for the coming months, but we’re determined, we’re working hard and we’re very optimistic. We wish you all a very happy Christmas and a healthy, successful year ahead. We’ve just started a new project outside Rabat at Plage des Nations for Prestigia, with whom we’re also working in Marrakech. 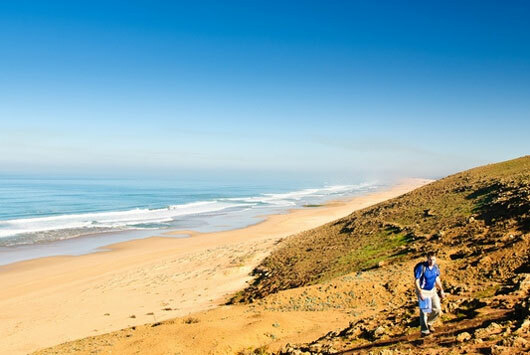 The project itself is on a vast parcel of land about twenty minutes drive from the centre of Rabat which will, eventually, be home to about 40,000 people as Prestigia build what is, effectively, a new town on the edge of the Atlantic, with excellent road and rail links to Rabat. The site is gently rolling and sits on a cliff-top looking down onto one of the most pristine beaches you could imagine. Kilometre after kilometre of clean, uncrowded sand. While I’ve spent a lot of time in Morocco over the years, primarily in Marrakech and Casablanca, I’ve never been to Rabat before. I have to say I was hugely impressed with it as a city. It is clean, organised and calm – the word that came to mind more than any other is gentile. There’s a new (less than a year old) whisper-quiet tram system throughout the city and it’s charming. As we were leaving our hotel on the way out to site, we realised that it was less than a five minute walk to the Tomb of Mohammed V and his son, Hassan II, the last two Kings of Morocco, as well as the Tour (Tower) Hassan, which was designed by the same person that designed the iconic Koutoubia tower in Marrakech. Towards the end of the day, I nipped down there at sunset to take in the sights, and a few pictures. Above: Robin Hiseman looking at the impressive Plage des Nations model. Above: Robin Hiseman on the picture postcard beach at Plage des Nations. One of the great pleasures of this job is going back to see old friends and clients from time to time and seeing how things have progressed. 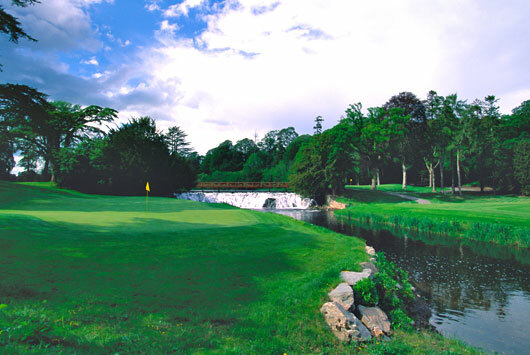 We had the opportunity to do that with Carton House Golf Club a week or so ago and, although the weather was absolutely shocking (I was with EGD’s very own Rain Maker, Ross), it was so good to see both courses there, The Montgomerie and The O’Meara, looking in such great condition – the Course Manager, John Plummer, and his team are really at the top of their game. 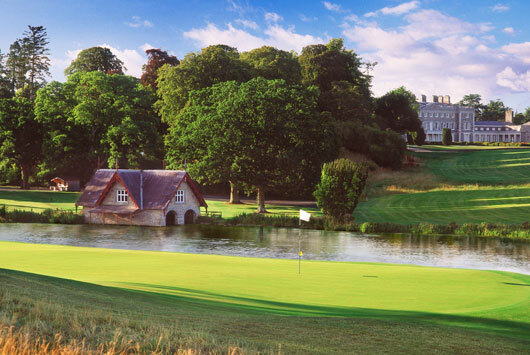 Since the courses opened in 2003 and 2004, the hotel has opened, the houses around the course have been built and the golf club has gone from strength to strength. Developed originally and now led by the Mallaghan family (who are also at the top of their game), Carton House is bucking the trend in Ireland by staying busy, retaining members, and generally providing some bright light in what can look quite a gloomy economic environment. We were there to talk about revising the course layout to take advantage of some changes to the original planning restrictions which means we can now provide a much more logical and attractive link between the golf course and the clubhouse. If you’ve never been, and find yourself in Ireland, make sure to visit – you’ll not find a warmer Irish welcome anywhere. Just don’t go when Ross is there. Above: 18th hole on the Montgomerie Course. Above: 15th hole on the O’Meara Course. Forgive me for writing to you en masse, but there are so many of you to inform that I hope you’ll understand it is impractical to do so individually. I’m writing to let you know that Sarah has decided that, after thirteen years with us, it’s time for a new challenge in her professional life. She has been offered, and has accepted, the role of PA to Colin Montgomerie. As you may know, we have been working on Colin’s design work in Europe, Africa and the Middle East for many years, as well as designing and managing his web site more recently. As such, Sarah already knows a great deal about his business activities which will stand her in very good stead for the future. Because of the close link between Colin and us, we’re not saying farewell to Sarah – we’ll be in touch with her on a regular basis on both design issues and for the web site – but we are saying goodbye and, on behalf of everyone here, thanking her for all her efforts over the past thirteen years. As importantly, we’re wishing her much success for the future. For the future, if your contact with Sarah was as a supplier, your contact now will be Shara Reedman (sreedman@egd.com). For all other matters, please send any emails to me. Forgive us if we blow our own trumpet on this one, but with the announcement this week of the new list of the Top 100 Courses in Continental Europe, we’re thrilled that five of our designs have been recognised. We don’t design projects with the sole intention that they make such lists, but it’s always reassuring when independent experts acknowledge the quality of the work we’re doing. So, with thanks to the panel at Golf World, we’re delighted that PGA Catalunya, The Faldo Course at Sporting Club Berlin, The Sultan at Antalya Golf Club, Navarino Dunes and Linna Golf have all been rated as worthy of inclusion in this year’s list. With five courses in the Top 100 (and two in the top fifteen), we are joint second (with Cabell Robinson) of the currently active design firms in the rating of the most prolific designers on the list with Robert Trent Jones Jr leading the way with seven courses (although, admittedly, he’s been at it rather longer than we have). What do you say when the eight times winner of the European Tour Order of Merit asks you if you want a date? In Marrakech? Luckily, having momentarily wondered how our relationship had blossomed so much without me appreciating it, I realised that hed seen a plate of dates and was asking if I wanted one. That minor confusion aside, the past couple of days I’ve spent with Colin Montgomerie in Marrakech have been great fun. We were there for the official public launch of a project were working on with him within sight of the famous walls of the old city, La Mamounia Hotel (where Winston Churchill used to stay) and the Koutoubia Menara. The location, in terms of access from the airport and to the city, couldn’t be better. The project is being developed by a company called Prestigia, based in Casablanca. The launch started with a reception for about 100 people on the site and then shifted to Royal Golf de Marrakech, a beautiful and historic course set close to the royal gardens of Jardins de l’Agdal. A nine hole scramble, starting at dusk, meant that the fairways and greens were lit with lanterns and the players were all given luminous balls to play with as much as he was interested to see it, Monty somehow doubted this was going to ever be a feature of European Tour events. Then, back to the project for a buffet dinner and musical extravaganza before the prize-giving which started at about midnight. If you’ve never been to Marrakech, give it a go. It’s an extraordinary place. Seve, thank you so much. You inspired me. Having just heard the news that Seve died this morning, I’ve spent the last few minutes reflecting. I watched him play many times, but I never met him. All the same, in some small way, I (like many people I suspect), felt that I knew him a bit because he was an open, honest character: what you got with Seve, for good and bad, was transparency – you knew, just by looking at him, how he felt and how he was playing. I started playing golf in 1976. The first tournament I ever watched on TV was that year’s Open from Birkdale, where Johnny Miller held off the challenge of this young, frighteningly talented Spaniard. I will never forget his chip over the bunkers to the final green and the massive ovation that he received – for someone who thought that it was only footballers that were idolised by the masses, this was a moment of revelation for me. From that point, the first name I looked for in any tournament summary was Seve’s. There were many triumphs, there were almost an equal number of disappointments – whatever happened, the one thing you could never say was that following him was dull. But, for all the victories he had, the one event that stands out as a testament of his passion, fire and competitiveness was a defeat. His match in the 1995 Ryder Cup against Tom Lehman was to be his final match as a player and, if the truth were to be uttered, he really should not have been playing, such was his form. To watch someone so utterly outplayed by his opponent, but managing to remain in the match for so long through nothing else than inspiration and determination, in equal measure, was mesmerising. Even though he lost, for me it was a most unbelievable feat of sporting competition. Now, he has finally lost his fight for life. Many more eloquent epitaphs will be written than this, but from this fan – Seve, thank you so much. You inspired me.